GlaxoSmithKline says its potential Ebola vaccine will come ‘too late’ for the current outbreak despite being fast-tracked. In August the company said that trials would begin soon, with the vaccine rolled-out by 2015 if everything went to plan. But today in a TV and radio interview with the BBC, Dr Ripley Ballou who is the head of GSK's Ebola vaccine research says that it will ‘well into 2016’ before they would be able to manufacture the amount required. 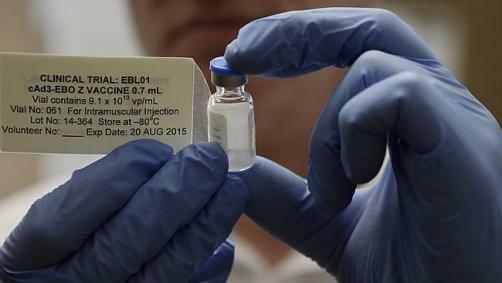 "I don't think this can be seen as the primary answer to this particular outbreak,” he says. “If it does work then it’s to be able to be prepared so that we don't have to go through this again in five years, or whenever the next epidemic is going to break out." Ana Nicholls, a healthcare analyst at The Economist Intelligence Unit, adds: “Progress [in vaccines] is further behind other treatments, and full trials can't be skipped. Vaccines are, after all, going to be used on large numbers of people who are currently well, which means the standard of proof for safety and effectiveness is higher. “That is why GSK is right to say that the vaccine it is developing is unlikely to have any effect on the current outbreak of the disease, always supposing that comes under control soon,” she adds. So it seems better progress has been made so far in developing treatments for the disease, than in vaccinations to prevent it spreading. GSK is not just racing against the spread of the disease itself – rival companies are also rushing to get vaccines approved. Johnson & Johnson announced that its vaccine will be fast-tracked and human trials will now start in early 2015, a year earlier than originally planned. The World Health Organization is now allowing untested medicines that have skipped some clinical trials to be used on patients. One of the frontrunners in this race is Mapp Biopharma’s ZMapp, which has been given to several healthcare workers to date. Some of these patients made a full recovery but others later died, and there is not yet enough data to say whether the medicine is truly effective. Also there is TKM-Ebola from Tekmira, which has also been used on humans with similarly mixed results. Chinese drugmaker Sihuan Pharmaceutical Holdings, meanwhile, has said that its JK-05 drug is an effective treatment for Ebola and hopes to get it approved soon, although it has so far only been tested on mice. With the WHO warning that there could soon be 10,000 new cases of Ebola per week, UN chief Ban Ki-moon has appealed for more donations to the $1 billion trust fund he launched in September. The fund has only received $100,000 from Columbia, despite many countries pledging money. Medecins Sans Frontieres (MSF) also says that pledges of aid and deployment from the international community have not yet had any impact on efforts to control the spread of the disease. So far it has killed around 4,500 people, mostly in the African countries of Liberia, Guinea and Sierra Leone. Africa’s most populous nation Nigeria also saw several cases, but after a quick response the country is close to reaching the 42-day benchmark needed to be declared Ebola-free by the WHO. There have been a few cases in Europe and the US too, however. A nurse in Spain and a Liberian national visiting his family in the US were among the first to contract the disease outside of West Africa. Two of the nurses who treated the US patient, Thomas Eric Duncan, have since become infected, leading to heavy criticism of the health authorities’ response in the country. One of the nurses flew on a flight from Ohio to Dallas a day before she started displaying symptoms of Ebola. Public health officials now want to interview the 132 other passengers, although they have said that there is little chance that they have caught the disease.